You first read about the Aston Martin Valkyrie AMR Track Pack in our exclusive story a couple of months ago. Aston has now officially announced the Track Performance Pack for the Valkyrie. As reported by us earlier, the Track Pack is essentially the standard car with more aggressive, aero focused body panels borrowed from the AMR Pro. The AMR Track Performance Pack features a new aerodynamic front clam shell delivering greater downforce and efficiency, lightweight titanium brakes, track-focused suspension, matte black magnesium performance wheels and carbon-fiber aero wheel disk set. With this, the Valkyrie will be able to deliver approximately 8% quicker lap times. However, the track-pack will also make the Valkyrie non street-legal. Thankfully, customers will also be provided with a second set of road-going panels that can be installed in place of the track-pack components. 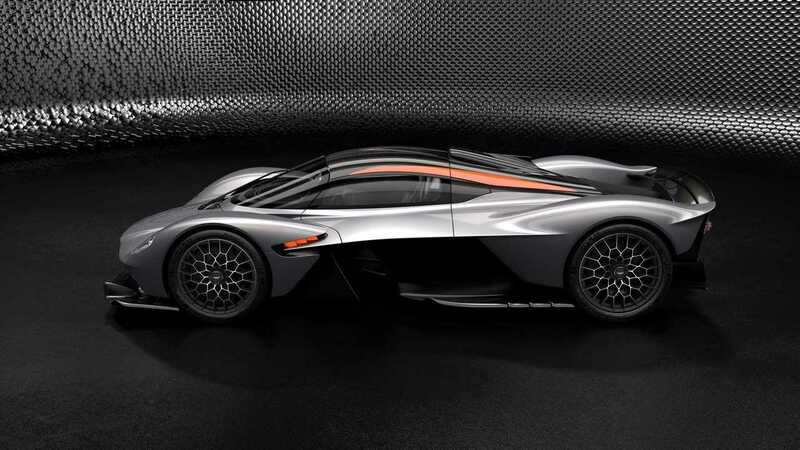 Valkyrie customers will be able to take their F1 inspired hypercar owning experience to the next level as Aston Martin is also offering a suite of personalized pit garage and race suit accessory options. While Valkyrie customers who choose to go with the track pack will be able to customize the hypercar to their liking, three AMR designer liveries by Aston’s “Q” department will be available to them as default. Similarly, four designer specification themes are available for the standard Valkyrie with color choices that include Slipstream Green, Liquid Petroleum, Ethanol Silver and Maximum Orange. 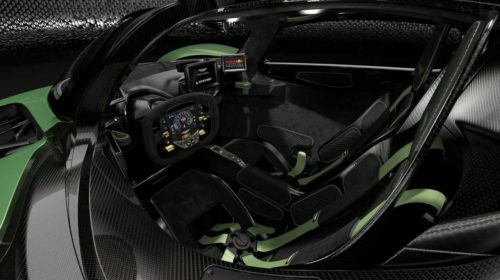 In addition to the designer themes for the entire car, customers can also choose from a variety of configuration “packs” including the “Indulgent Gold Pack” which features a 24-carat gold leaf livery laid under the paint lacquer and the “Mokume Carbon Fiber” option pack for the carbon fiber connoisseur. The Mokume Carbon Fiber pack will adorn areas such as the inner scoop of the headlights, side pod vanes, armrest, central interior vent and the steering wheel face plate. On the inside, there is a wide choice of colors for the Alcantara along with six color options for the seat harness. A number of patterns and finishes are available for the seats and bespoke woven leather, first seen on the Aston Martin One-77, can be selected for the door pocket and arm rest trim. The switchgear can be specced in anodized silver, black or red for a track-inspired appearance. In case, all these options aren’t enough for customers, Aston’s Q department is ready to make their wildest Valkyrie dreams a reality. “This is simply the best car in the world if you want something bespoke and we are really pushing the boundaries to match the dreams of our customers” said Aston Martin’s Executive Vice President & Chief Creative Officer Marek Reichman. “Every single element of this hypercar, including its performance, can be personalized. The materials are very much about science, the art of creativity and the ability to create a unique solution that doesn’t detract from this exceptional car’s performance capability”. In order to help customers ensure that their selections turn out true to their vision, Aston is also providing customers with the opportunity to view their final creations in virtual reality. When it finally launches, the Valkyrie will be the most potent car in terms of performance. But, with such a wide array of customizable options, it is also turning out to be the most customizable hypercar ever.